This benefit gives you a chance to see one of free jazz’s living legends, John Zorn, wail and chirp on the sax, and the the admission (hefty by Stone standards but reasonable by any other) goes toward a worthy cause — his intimate, meticulously curated non-profit venue. Tonight, Louie Belogenis accompanies him on the sax. 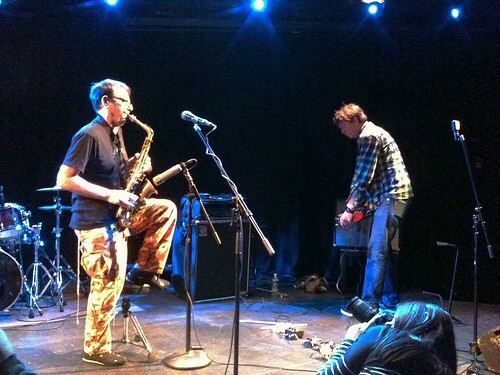 John Zorn and Thurston Moore at a Faculty Against the Sexton Plan fundraiser at LPR in 2012. The saga of Sonic Youth’s Thurston Moore and Kim Gordon has been back in the news lately (and by “the news,” we mean Pitchfork and Brooklyn Vegan). Thurston says he’s now in a “really romantic place” but next month, he’ll step into a not-all-that-romantic place: John Zorn’s East Village hole-in-the-wall, The Stone. As it turns out, Kim’ll be there too — about a month later.